The Sound of the Valve "Embryo"
Italian loudspeakers have earned a very good reputation worldwide, thanks to their sonic virtues and their classy and cool looks. Most of these are quite traditional designs but there are many "new kids on the block" who dare to work and design "differently". This is a one-man band devoted to designing and manufacturing single ended tube amplifiers and full-range crossover-less loudspeakers with proprietary drivers. Incindentally, Stefano Zaini is also the man behind the organization of the Milan Hi-End Show and the later Rome HiEnd Show (1st ed. scheduled for November, 8-9). I'm no big fan of full-range drivers so when Stefano proposed me to test his latest creature, this Embryo, I admit I was a bit reluctant, to say the least. I've never been a big fan of Lowthers, as well. Anyway, a reviewer should be ready to review everything, so here I am, armed and ready. 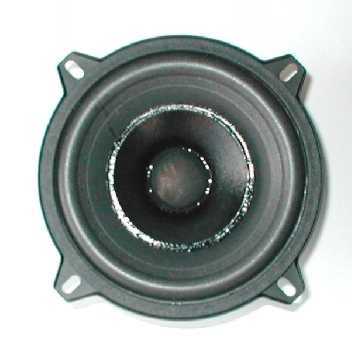 The speaker uses two 4 ohm drivers connected in series, so to achieve the classical 8 ohm load. A 8 ohm version of the drive unit is available as well. Sensitivity is claimed to be a respectable tube-friendly 93 dB/w/m. Of course, the Embryo doesn't use crossovers of any kind so the drive units are directly connected to the amplifier. The second driver is mounted in the rear, at a 45 degrees angle. It should "help" the front driver to create a wider and deeper soundstage. When asked about the recommended ancillaries, Mr. Zaini suggested to use low powered amplifiers, possibly with tubes, better if single ended with 300B tubes. Hence I asked the Italian distributor of Opera Audio for a pair of tube amplifiers that will fit the bill. They sent a 8.8 Reference, a push-pull of 6550's (50 watts per channel) and a J5000 Plus, a single ended 9-watts with a pair of 300B's, exactly as suggested by Mr. Zaini. My personal opinion is that a good HiFi component should work well with many different components and partners but I didn't want to leave room for unpleasant discussions. Of course, I tested the speakers even with solid state amplifiers (integrateds and pre/power combos). Drivers: 2 x 1 ZS 130-4-1 (130 mm) - dual-cone, full-range. Power handling: 30 watt rms each. Quite often, I've found full-range drivers to be a tad shouty in the mids, with light and inconsistent bass and wooly highs. On the contrary, the ZS 130 units delivered a smooth sound, with plenty of bass and even quite recessed mids. Shouty? Not at all! The tonal balance is definitely on the warm, warm side. Overall, I've found the Embryo's a bit shut-in, with a slight tendence to sound "boxy". The high range is quite extended, considering there's no tweeter, while the deep bass, thanks to the complex TQWT load, appear, from time to time, to be affected by an unpleasant "overhang" effect. In other words, the deeper bass doesn't sound coherently linked to the rest of the audio spectrum, like it was reproduced by a (slower) separate unit. When partnered with the Opera 8.8R (push pull of 6550's tubes) the tonal balance changes a little bit, offering an overblown mid-bass which may sound pleasant on some recordings but definitely too much of a good thing on most tracks. Switching to the Opera J5000 plus (SE with 300B's in class A) improves things a bit, with a clearer midrange and tighter mid-bass. Of course, there are laws of physics that can't be forgotten, so 9 watts on 93 dB/w/m are hardly enough to cope with high dynamic recordings requirements and, considering I use to listen at very high levels, clipping occourred more than once. Not so with the 50 watter (though I've been able to fully exploit its power output) but I definitely prefer (power output aside) the partnership with the 300B tubes. The Embryo's seem to prefer to sound euphonic, rather than precise and detailed. If you want to get an idea of their character, think at the classical "old tubey sound": smooth, with shy highs, clean mids and overblown bass and mid-bass. It is a sound one may need a couple of weeks to familiarize with, but once the brain gets used to it, it becomes quite easy on the ears, and definitely not tiring on the long run. Switching to more traditional tower loudspeakers one immediately detects the "relaxed" sound of the Embryo's, made of less vibrant drums, less sharp attacks and softer voices and strings. The claimed "coherency" of the full-range drivers has been destroyed by the deeper bass performance and it is not difficult to find traditional speakers that sound as "seamless" as these units. The Embryo's can sound quite loud, provided the amplifier isn't too underpowered. 93 dB/w/m is a sensitivity which isn't hard to find on absolutely traditional louspeakers so, matching the Embryo's to 1-2 watts amplifiers (as suggested by the manufacturer!) is a pure nonsense, in my opinion. Even the 300B's 9 watts per channel weren't enough. Just play the track "Howling" (by Morcheeba, Who can you trust album - China Records - 0630-14373-2) and you'll immediately understand what I mean. The sismic bass frequencies drain so much power from the tubes that clipping is extremely easy to achieve even at moderate listening levels into a SMALL room. The same happens on the track "Never an easy way..." which I used as subtitle for this article. Of course, everything becomes sufficient (even 1 watt!) if one is used to listen to Music while chatting with friends, reading a book or whatever. The assumption we mostly need 1 watt when listening to Music is FALSE (at least in my case ;-)) because it is true you don't always need power...but you need PEAKS!!! Incidentally, the dynamic performance of the Embryo's improves switching to highly dynamic solid state amps, Naim, just to name (ooops) an example. The sound becomes quicker, dynamic jumps more realistic (and effortless) and everything seems to play more "in tune", if you know what I mean. Anyway, the Embryo's seem to dislike loud listening levels. They _can_ sound loud but somehow they tend to lose their coherency, everything becomes more confused and...distorted. In a word, they prefer moderate listening levels, light jazz Music or light Pop in particular. They do not have the "grunt" for realistic rock performance nor the pace, rhythm and timing required to make your feet tap the floor. They are a bit slow, if I may, with a deep bass note that "arrives" always too late to suit my taste. With the aid of the rear firing driver the soundstage created by the Embryo's is quite wide and deep. The presence of this second unit helps to counterbalance a slight tendence of the ZS 130 unit to sound a tad "forward" anf in yer face. Careful positioning is mandatary to avoid the sound coming directly from the speakers as well to find the right tonal balance. Full range units do not like to be listened "off axis". With the Embryo's only a slight amount of toe-in is necessary, indeed. These speakers do not impress for precision or transparency hence the contours of the instruments which crowd the virtual scene do not appear very precise or focused. From time to time voices appear bigger than they should be. The best geometrical parameter of the virtual stage created by the Embryo's seems to be the width, well extended beyond the speakers. The soft rubber feet may have influenced the precision of the stage, considering the towers are quite tall and..."unstable". Perhaps one could try firmer and stiffer feet (even spikes). If you are used to low listening levels, even a sub-10 watt amp will suffice. If, like yours truly, you prefer realistic sound pressure levels, choose a meaty amplifier. The load is easy and the sensitivity is high but I wouldn't use less than 25 good watts with the Embryo's. Actually the 50 watts per channel of the Opera Audio 8.8R were barely sufficient. Try experimenting with different feet and room positions. To get the best from these speakers you need to spend a lot of time with them. In order to get a decent amount of right timing, avoid lazy and slow tube amps. The faster the better. First of all, the name. "Embryo" reminds me of something not completely finished yet and brings memories of echographic screens shots and fetal images. 1,400 € for a factory-direct loudspeaker equipped with two 90 € units and no crossover is an awful lot of money. One has to take into account these babies are made by hand on request (more or less) so there's a price to pay. Different finishes are available (mine was piano black one) at the very same price (which is good). The quality of the finish is questionable, at least on the sample I've received. Piano-black finish is something hard to get right and defects become immediately evident. Right out of the box, my wife detected several "weak spots" in the piano lacquer finish (women do have an attitude for this ;-)), something I'd prefer NOT to see on loudspeakers into this price range. Monowiring binding posts are of good quality while the aforementioned rubber feet make the speaker tremble quite easily. If you have pets or small children...beware! as the speakers can be quite dangerous for them. Not everyone's cup of tea (definitely NOT mine) these speakers can please more than one Music lover. Easy on the ears, relaxed and warm sounding, they can be listened to for hours at moderate levels. They simply can't rock, lack deep bass coherency and sound a bit too warm, boxy and shut-in to suit my taste. Yeah, I know I always "speak my mind with a gun in my hand" (cf. "Ride like the wind"). As said, these speakers won't suit everyone's taste. They need to find the right partners and the right customer as well. According to Mr. Zaini's, these Embryo's are his best selling model. 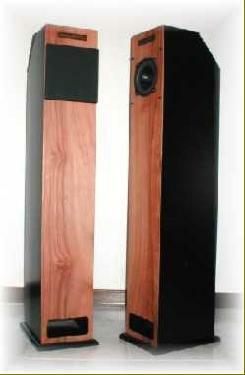 Considering their slim looks and unobstrusive size they will be welcomed on most listening rooms. You won't find these at regular HiFi dealers, so you can evaluate them either directly at the manufactuer's or at HiFi Shows.